This journal is a support tool with guidance and support embedded in the pages to aid the writer in connecting with those of the angelic realm. The human spirits of Mother Earth are wakening to a longing of something lost. In our moments of distracted concentration we are “remembering” our blessed connection with God. In reality, we are, in all moments of our lives, blessed with an angelic entourage of angels, guides, teachers and deceased loved ones that are available to assist us with guidance in every facet of our lives as well as provide love and support. The physical world is confusing and often times our divine life pathway is obscured by shadows of false teachings and conditionings. Each one of us has the ability to connect with our angelic entourage to bring light to the shadows and illuminate our highest good. 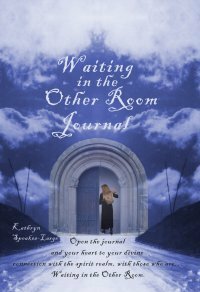 The Waiting in the Other Room Journal is a place to record your divine connection with your entourage and crowd of angels, guides, teachers and deceased loved ones. It is a place to get to know and embrace your authentic self by exploring through writing the essence of who you truly are. Sprinkled throughout the journal are messages from the angels. You may order the journal below. You will be notified by email when the journal is mailed to you.